Not surprisingly, the construction industry is one of the most dangerous industries in which to work - second only to deep sea fishing. Many construction workers - in fact around 65% - use scaffolding on a regular basis and scaffolding accidents are responsible for around 50 deaths per year and over 4,000 accidents per year in the United States. 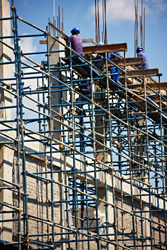 Many scaffolding accidents involve immigrant workers who are often unskilled and lack any adequate training. It isn't just construction workers who use scaffolding regularly - painters, carpenters, electricians and window cleaners all use scaffolding during a typical working day. Around 70% of workers hurt in scaffolding accidents are hurt by falling objects, slipping or a support giving way. There is a financial cost as well - it is estimated that scaffolding accidents cost around $90 million in lost workdays every year. OSHA (Occupational Safety and Health Administration) oversees scaffolding safety and guidelines and they have a long list of requirements to ensure that scaffolding is put up and used safely. Some states also have their own regulations - for example, New York has enacted what it calls the "scaffold law" in an effort to further protect workers from injuries. It sounds obvious, but scaffolding should be capable of easily carrying a maximum weight - in fact it should be able to support up to four times its maximum intended load. The storing of building materials on scaffolds is also prohibited - OSHA prohibits the storing of masonry units on scaffolding several days prior to their use and also does not allow the storage of materials overnight. While working, don't keep tools and materials on the scaffold unless actually needed. Once scaffolding has been erected, OSHA also requires that the scaffold should be carefully inspected by a qualified person before the start of each shift. Also a further inspection should take place after any occurrence which may effect the scaffold's stability - heavy rain or winds, for example. Scaffolds should also not be used during high winds - defined as gusts of 30 mph or higher - and should be properly cleared of any debris, mud, snow or ice before being used. While working on - or near to - a scaffold, you should always wear a hard hat and non slip shoes. And if you are working on a swinging scaffold, you should always make sure you wear a safety belt or harness attached to a secure structure - not to the scaffold itself. It's also a good idea to attach a net in case of falling tools or materials - although a net is not meant to take the weight of a person. A scaffold should not be a dangerous place to work - always follow OSHA and any local guidelines to ensure an accident free workplace.